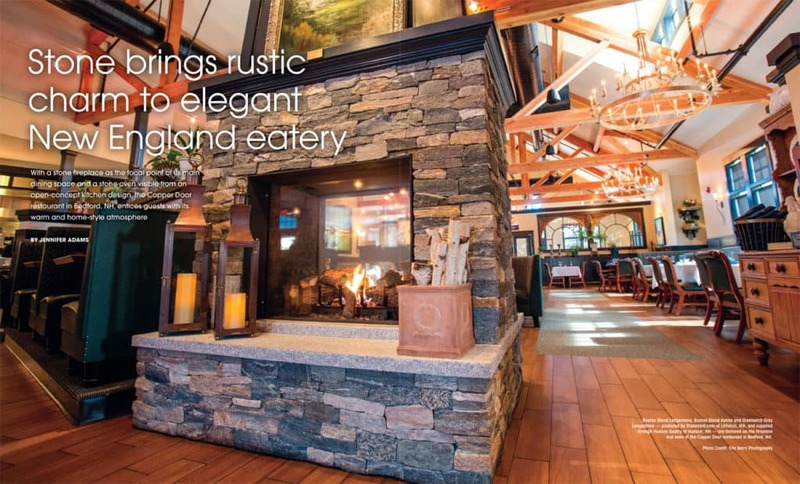 Elegant, warm and inviting are the three words designer Dana Boucher of Breath of Fresh Art uses to describe the interior dining space of the Copper Door restaurant in Bedford, NH. At the heart of the 8,000-square-foot design is a floor-to-ceiling fireplace with the surround and hearth built of a blend of three stone varieties, which were produced by Stoneyard.com of Littleton, MA, and supplied through Hudson Quarry of Hudson, NH. 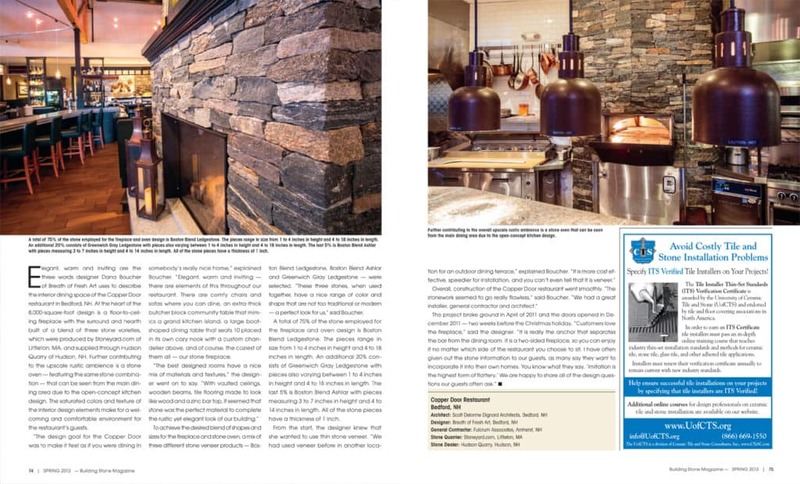 Further contributing to the upscale rustic ambience is a stone oven — featuring the same stone combination — that can be seen from the main dining area due to the open-concept kitchen design. The saturated colors and texture of the interior design elements make for a welcoming and comfortable environment for the restaurant’s guests. “The design goal for the Copper Door was to make it feel as if you were dining in somebody’s really nice home,” explained Boucher. “Elegant, warm and inviting — there are elements of this throughout our restaurant. There are comfy chairs and sofas where you can dine, an extra-thick butcher block community table that mimics a grand kitchen island, a large boat shaped dining table that seats 10 placed in its own cozy nook with a custom chandelier above, and of course, the coziest of them all — our stone fireplace. 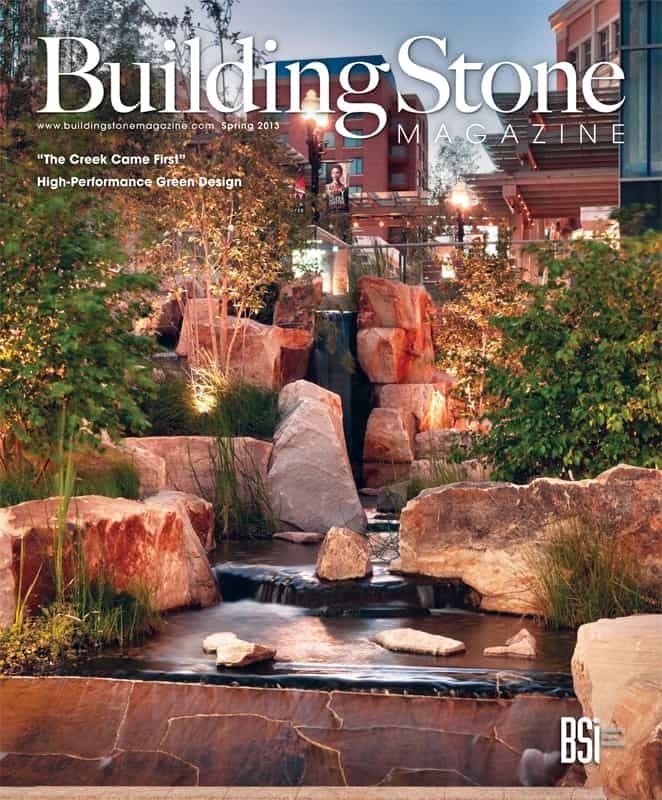 To achieve the desired blend of shapes and sizes for the fireplace and stone oven, a mix of three different stone veneer products — Boston Blend Ledgestone, Boston Blend Ashlar and Greenwich Gray Ledgestone — were selected. “These three stones, when used together, have a nice range of color and shape that are not too traditional or modern — a perfect look for us,” said Boucher. A total of 75% of the stone employed for the fireplace and oven design is Boston Blend Ledgestone. The pieces range in size from 1 to 4 inches in height and 4 to 18 inches in length. An additional 20% consists of Greenwich Gray Ledgestone with pieces also varying between 1 to 4 inches in height and 4 to 18 inches in length. The last 5% is Boston Blend Ashlar with pieces measuring 3 to 7 inches in height and 4 to 14 inches in length. All of the stone pieces have a thickness of 1 inch.